Elephants play a significant role in South Asian, especially Hindu weddings. From carrying the groom on the baraat to praying to Lord Ganesha, we see elephants everyone. Even in baby showers, elephants are loveable, intelligent, wonderful creatures. It is hard not to fall in love with them! If you want to incorporate elephants in more than just invitations and stationary, go big. Literally. Think about getting a wedding from one of these amazing cake artists. 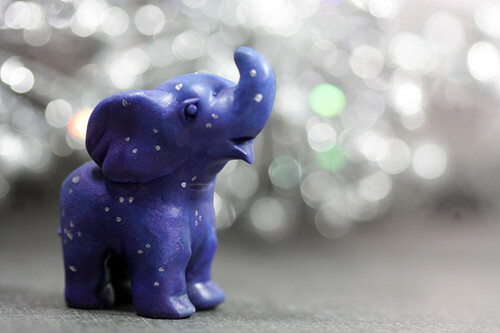 Forever Elephants - For a pair of elephants to last a lifetime, choose ones made out of clay. This Love in Gold couple can be your cake topper and keepsake long after the cake is devourvered. Karly West, The Republic of Cute, Cleveland, OH. Bite size of big - Elephants maybe the largest animal walking on land but that doesn't mean you cannot turn them into bite size cakepop bites. These pink and blue cake pop elephants are sweet, tasty, and perfect. A Royal Wedding - Ivory elephant wedding cake with gold and royal purple details. It is fit for a rani and raja! Studio Cake, Menlo Park, CA. The Golden Age - For a regal and elegant look go with cakes that are bold and beautiful. Purples, magentas, and marigold orange with trims of gold will give you that feeling. Plus, want to eat the cake topper elephants now? These lovelies are made from modeling chocolate and fondant; perfect for the sweet tooth. Butterfly Bakeshop, New York City, NY. Maharaja's Dream - This fabulous groom's cake screams royal. Inspired on her trip to India with beautiful, real elephants painted, Heather created a groom's cake fit for a maharaja. Heather Barranco, New York City, NY. 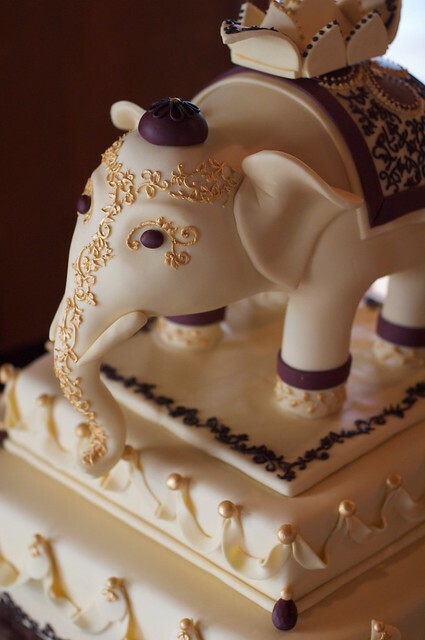 Have you had an elephant wedding cake at your wedding that you would like us to feature? Contact us and let us know!